NRO Dan Ulrich and Guest of Honor Kaden Hanson. 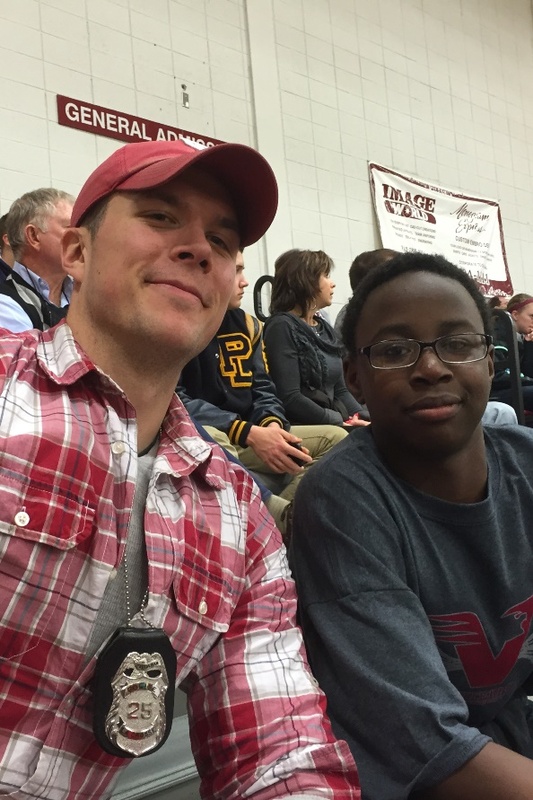 During the Saturday, February 21st, Viterbo men’s homecoming basketball game, the La Crosse Police Department, Viterbo University, and the La Crosse Area Boys and Girls Club – Amie L. Mathy Center announced a special surprise to the crowd of spectators. Amongst the spectators were La Crosse Police Neighborhood Resource Officer Dan Ulrich and Kaden Hanson, an 7th grade student at Longfellow Middle School and regular attendee at the Mathy Center. Over the past several months, NRO Ulrich has gotten to know Kaden pretty well as part of his regular visits to the Club. NRO Ulrich found Kaden to be an excellent student, mentor, and friend – a shining star. He wanted to find a way to recognize Kaden, so NRO Ulrich worked together with the Mathy Center Boys & Girls Club and Viterbo University to come up with something special. Kaden was completely surprised, but thought it was pretty cool!